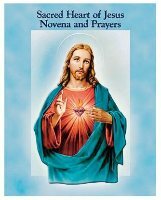 DIVINE CHRISTIAN GIFTS - Small Booklet - Sacred Heart of Jesus Novena and Prayers. Small Booklet - Sacred Heart of Jesus Novena and Prayers. Small booklet -Sacred Heart of Jesus novena and prayers. Laminated cover color illustrated with beautiful Italian artwork thorough the book. 40 Pages 3 3/4" x 3 1/2"